Congratulations to Michele Figliuolo & Jessey Michaels for receiving the NJIC Sportsmanship Award for Waldwick High School. Both students attended a luncheon on Wednesday, May 29th at the Chart House in Weehawken. This past Saturday Mr. Drechsel and four of his students competed in the Thomas Edison Foundation Design Competition at NJIT. Thirty-one teams were involved in the Competition and Waldwick finished in first place! Our school will receive a $500 Grant. Congratulations Jeremy Macomber, Kyle Sandve, Trevor Ramundo and Joe Hurban. Well deserved honor. Thank you to Mr. Meltzer and Mr. Marzullo for all their help on this project. 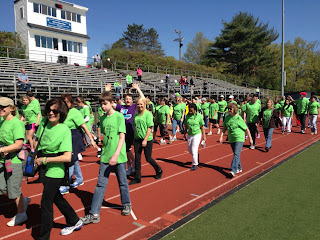 On Friday, May 3, the Physical Education classes, the Kids, Kids, Kids program and members of the HS Track team assisted the Forum School students in their annual walk-a-thon to raise awareness for Special Services and help the school raise funds to upgrade their computer system. The Forum School students walked/ran around the WHS track (assisted by WHS Students). After the walk-a-thon, members of the HS Track Team demonstrated several track and field events for the Forum School students. Special thanks to Mr. Clark for organizing this very special event.